Going into this, I thought Saikano couldn't get any more depressing than it already had been. I was promptly proved wrong. Another Love Song at first focuses on Chise's early days as the ultimate weapon, and follows her through just past the halfway mark of the actual series. Scenes from the series are intercut throughout, just so you know where you are in the series when all this is happening, and it's a real help. It also fills in some details that were missing in the series, so it was a nice touch. I still would've liked them to explain the anime ending, though. Added into all this is Lt. Colonel Mizuki, Chise's predecessor, who's being replaced by Chise, and is more or less her polar opposite. She also shares a mind link with Chise. So this means that not only do we get to watch her lose her humanity bit by bit and see its effects even more than in the series, we get to see how it happens mentally, and through the eyes of someone who's gone through it, and is only just starting to realize what's been done to her. You also get to see how utterly heartless the top brass are with regard to these girls. And it's absolutely depressing and heartbreaking, to watch all this, and it really kicks into high gear in the second episode of the OVA. The other love song of the title, which is between Mizuki and Tetsu, really takes a back seat to all of the former. But it's a nice touch, on the side. The art isn't really all that different from the series at all, and neither is the music -- although they do have a new song that plays over the credits, and it's a nice little song. Now, excuse me, I'm going to go slit my wrists. Science Fiction elements I had initially expected from Saikano. This 2 part OVA succeeds in delivering that.This OVA introduces another character of the military side of the story, explaining (but also kind of making confusing) the military point of view in it's exploitation of the Ultimate Weapon and their justifications for doing so in the first place. So, my point is Shuuji and Chise's point of view -&gt; Military point of view = a very good thing. Bottom Line: Watch this if you've watched Saikano. "Saikano: Another Love Song", being a follow up to "Saikano" (duh!) was probably doomed to mediocrity at best before it even began. Comprising just two episodes, it would have been hard for this set of OVA's to turn around the bad impression that the series left me with. Perhaps due to shadow of the aforementioned bad impression of the series, I couldn't really get into "Another Love Song". No surprise there, then. But what is surprising is how vast the improvement this OVA is on the series. For starters, being an OVA, "Another Love Song" benefits from having better production values. The visuals are much improved, even to my untrained eyes. But ironically, the main thing that makes "Another Love Song" better isn't what it does, but what it DOESN'T do - it doesn't repeat the series' mistake of cramming in as many tragic scenes as it possibly can in an attempt to invoke emotions from the viewer. This makes the OVA's more believable than its predecessor... though that's hardly saying much. "Another Love Song" introduces Mizuki, a crippled captain of the army (that's fighting that enemy who were never shown). More significantly, she is the prototype "Ultimate Weapon". Considering the original cast of "Saikano" consists of a bunch of angsty, irritating brats who were essentially puppets to the contrived story, Captain Mizuki is a welcoming addition, bringing a much needed air of maturity and sensibility. Her story fills in a lot of the details that were missing from the background of "Saikano". It's a job that needed doing badly, and it's a job the show does reasonably well. For example, it answers questions such as why Chise seems to be the only weapon of her kind (she isn't), and what was happening to her towards the end of the series. Of course, with only two episodes to play with, "Another Love Song" can only do so much. A lot of grey areas still remain - the sci fi is still mostly muddled, and the war unexplored. The story development, as much as it's smoother than the series, could have been better. Mizuki's change of attitude towards Chise seems sudden and groundless. The decision for the military commanders - who the anime was at pains to portray as cold and uncaring - to allow Chise to go to school and live like a normal girl is also baffling. Even though "Another Love Song" is short, it still found time to fit in yet another love triangle, one that feels like a tag on, like it was thrown in more for cementing its identity as a romance than any other purpose. Personally, I think the time could have been better spent filling in the ocean sized void in the story left by the series. 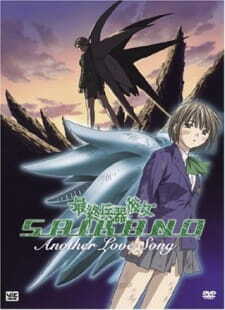 Still, I have to say that "Saikano: Another Love Song" surprised me by being a decent watch... which is far more than what I can say for "Saikano: The Last Love Song on This Little Planet".